Yellow Dog needs shoes to protect his nails from bleeding when walking on concrete. We worried Yellow might need surgery to correct his crooked legs but since he didn’t seem to be bothered by it, the vet said it’s not a problem. 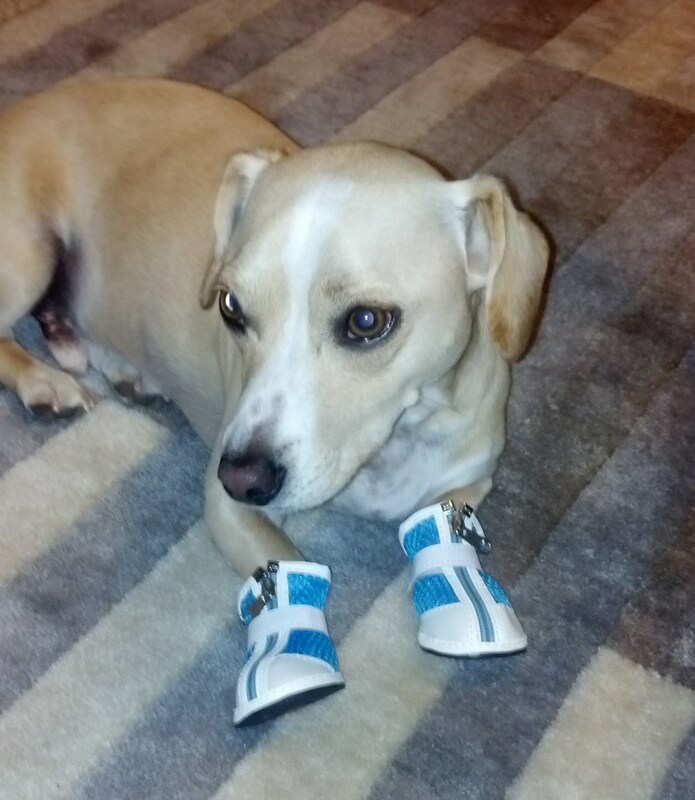 But we do need to protect his front paws…with shoes. It took some trial and error to find the right pair of shoes for Yellow. First, we measured his feet. To measure your dog’s paws, have your dog stand on a piece of paper and grab a pencil. 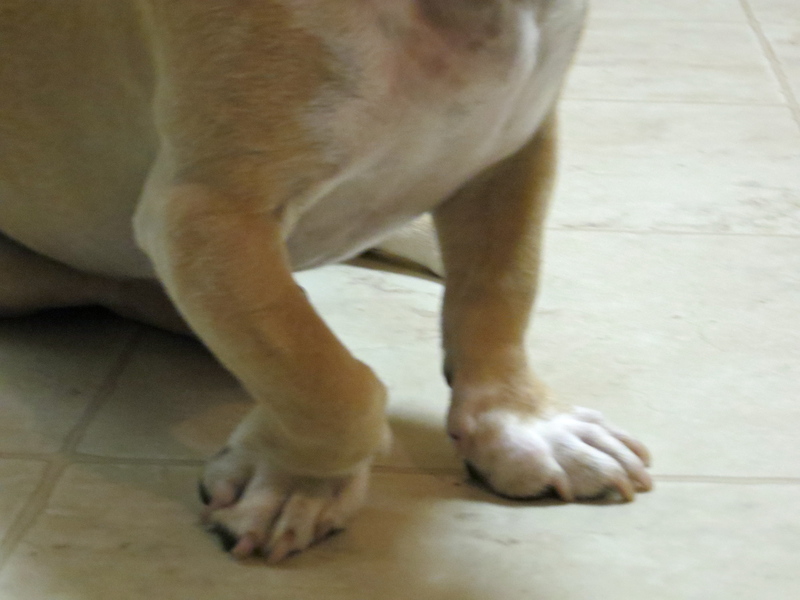 Draw four lines on the sides of his paws and then measure the length and width of your dog’s paw. This will make it easier to browse through shoe listings online. Yellow has some interesting feet; they’re almost square, measuring 2.1 by 2.3 inches. Pet stores like Petco or Petsmart don’t have a vast shoe selection, so we did all our shopping online at Amazon. Most sellers list the shoe’s dimensions but it still took four orders before we found the right fit. The shoes on the left were okay; they fit fine and did not slip off but they wore out quickly and Yellow had a tougher time walking/running in them. The shoes on the right are the big winner! They are a perfect fit, the zippers hold them in place and they are quite durable. We have bought replacement shoes but it took several months of regular use before they wore out, which probably had more to do with the way Yellow walks than the integrity of the shoe. You have to be careful when putting shoes on your dog. If they wear the shoes too often, they can lose the callus on their pawpad, and that’s not good. We try to regulate walks with Yellow to keep his calluses intact. Keep this in mind if you are putting shoes on your dog for the snow or hiking trails. And remember, shoes aren’t always just for being cute or fashionable! Sometimes, they’re doctor’s orders! 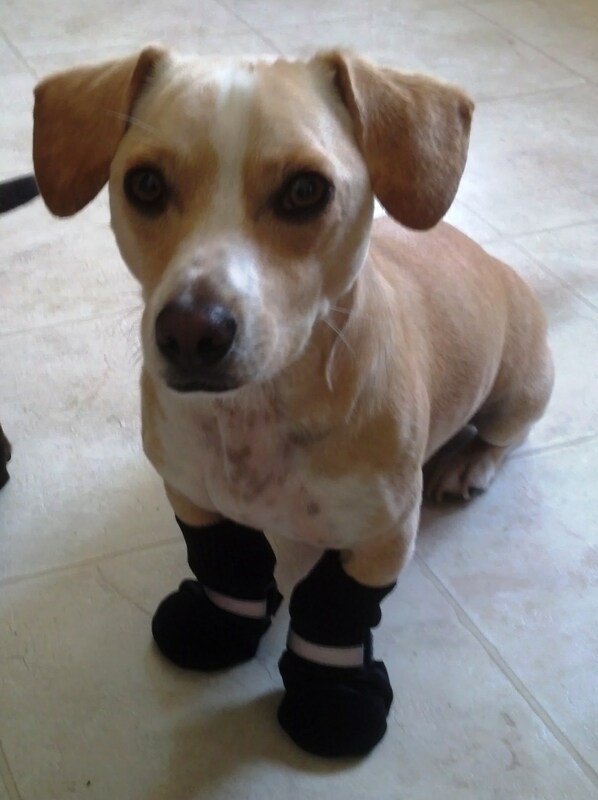 This entry was posted in Health and tagged dog clothes, dogs, nails, quick, shoes by jaqbennett. Bookmark the permalink. its very nice and pretty shoes. it is very fashionable and attrective. SassyDogFashion also told about fashionable for dogs and they also nice. Yellow Dog is Amazing and sooo Cute. 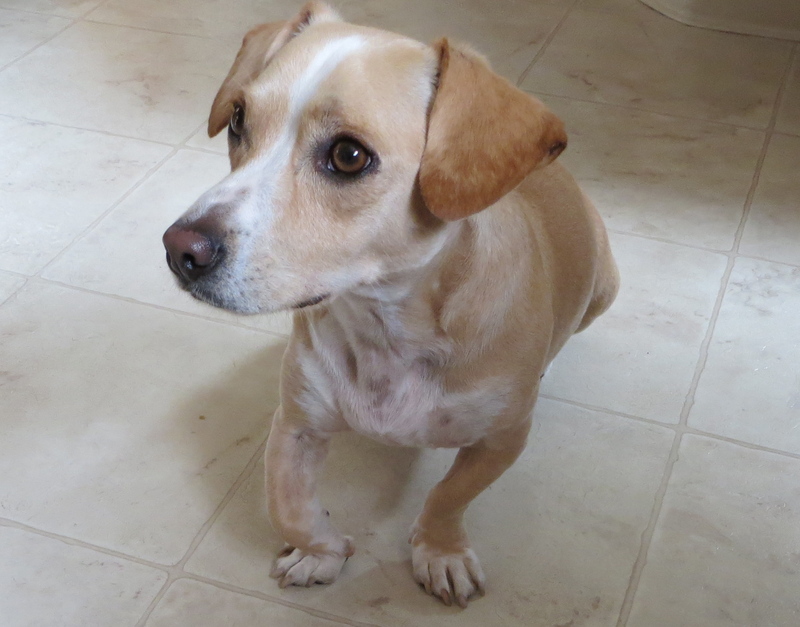 Your blog shows the love you have for Yellow and you are a true inspiration for all Dog Lovers. Keep it awesome and do keep sharing the importance of Shoes for Dog. Thank you, I really appreciate that comment! It means so much! Awww thank you so much, Michael! I just discovered Trex by Ruff Wear. They are on the expensive side, but they will certainly hold up over time! I think my dachshund has the same condition, although not as severe. Are there any updates on Yellow dealing with his leg? Experiencing any lameness now? I’m really nervous my Vet will suggest expensive surgery although is doesn’t bother my little guy at this time. Hi Mackenzie! Yes, Yellow still has his crooked little legs but they still don’t seem to be a problem. There is no lameness at all and the shoes really work to protect his nails from the concrete. If your vet does recommend surgery and you are questioning it, I would get a second opinion. I think surgery should be a last resort, especially if it’s not bothering you dog. Thanks for the comment! Bless you for all the love you give him. He is such a beautiful little dog, and you are a wonderful person for loving him and caring for him so much!